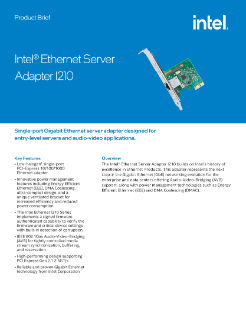 The new Intel® Ethernet Server Adapter I210 builds on Intel’s history of excellence in Ethernet products. Intel continues its market leadership with this newest generation PCIe* GbE network adapter. Based on the Intel® Ethernet Controller I210, this adapter represents the next step in the Gigabit Ethernet (GbE) networking evolution... for the enterprise and data center offering Audio-Video-Bridging (AVB) support, along with power management technologies such as Energy Efficient Ethernet (EEE) and DMA Coalescing. Read the full Audio Video Bridging for Time Sensitive Traffic Product Brief.